← Donald Ducking Duke: Trump’s betrayal of Republican’s Abolitionist roots. My $.02: Mitt Romney was behind Scott Walker and that didn't work out (too bad BTW--I really iike the guy) so now he's behind the only candidate left cause no one else wanted his help. Mitt didn't do well in MI at least not in my congressional district. Isn't getting a newspaper endorsement a "kiss of death" anyway. So, that's the real reason for the endorsement--to kill Kasich's campaign? And, when, if ever, in recent memory has a newspaper not endorsed the incumbent--my guess is the editorial board didn't even consult--just followed the standing order. As further thunking--the Devos' keep throwing their money toward social engineering issues which I've always felt is retaliatory for Dicky not elected gov. We are not fooled. Any issue or candidate they back is on my DONOTELECT list. As far as destroy the GOP--they pretty much have done it themselves--Lastly, isn't Kasich the most progressive of all the candidates professing to be conservative? Kasich is the only candidate still running (including native Carson) who is capable of providing anything of financial or politically connected consequence (locally) in return for even the simplest of political favors doled out now. by the DFP. He's been glad-handling over here for years and you are correct..this near mirror continuing endorsement in terms of the MIGOP's (almost certain) bleak future is an excellent opposition strategy. I vote for the "witless". 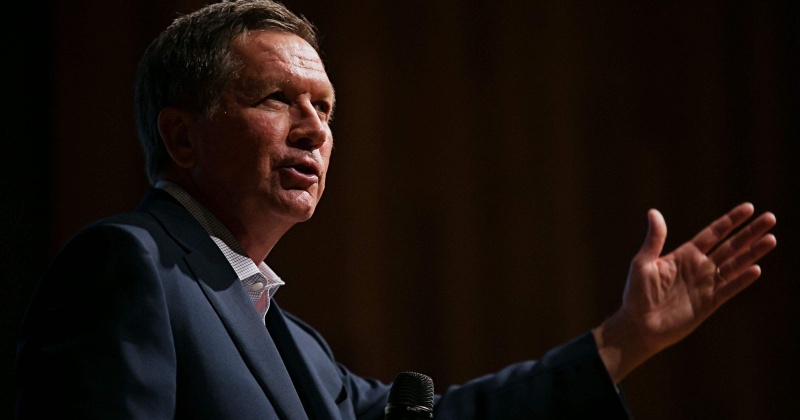 The Detroit News also endorsed Governor Kasich today. Now you know why Republicans in Southeastern Michigan are an endangered species.